Once we're cyborgs, we'll be funnier, sexier and more loving. 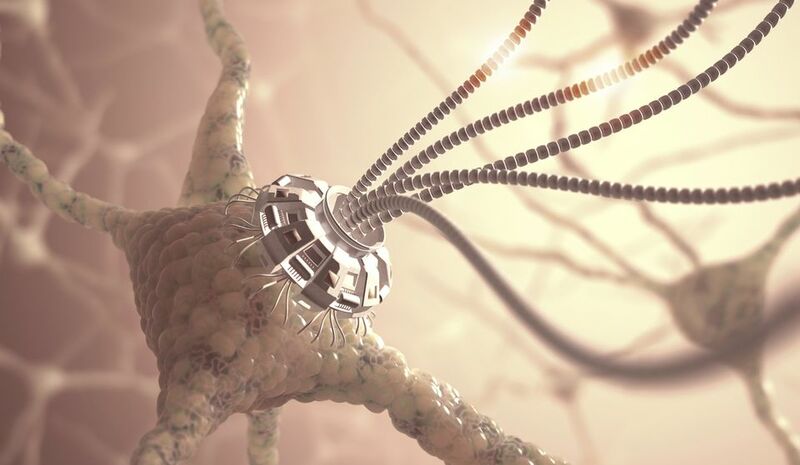 An artistic rendering of a neural network with an artificial connection in a nanotechnology concept. Futurist and inventor Ray Kurzweil predicts humans are going to develop emotions and characteristics of higher complexity as a result of connecting their brains to computers. “We’re going to be funnier. We’re going to be sexier. We’re going to be better at expressing loving sentiment,” Kurzweil said at a recent discussion at Singularity University. He is involved in developing artificial intelligence as a director of engineering at Google but was not speaking on behalf of the company. Kurzweil predicts that in the 2030s, human brains will be able to connect to the cloud, allowing us to send emails and photos directly to the brain and to back up our thoughts and memories. This will be possible, he says, via nanobots -- tiny robots from DNA strands -- swimming around in the capillaries of our brain. He sees the extension of our brain into predominantly nonbiological thinking as the next step in the evolution of humans -- just as learning to use tools was for our ancestors. And this extension, he says, will enhance not just our logical intelligence but also our emotional intelligence. “We’re going to add more levels to the hierarchy of brain modules and create deeper levels of expression,” he said. To demonstrate, he gave a hypothetical scenario with Google co-founder Larry Page. In addition to making us cleverer in hallways, connecting our brains to the Internet will also make each of us more unique, he said. Them nanobots are takin' over Roggie. Soon they will be running the show! Lol... and that would be a bad thing? It all depends on who did the programming of the bots and their "cloud". Hmmm, people winding up controlled by a hive mind some malicious bugger came up with to make sure folks actually work as long as thy can make them, or vote a certain way? maybe turn off the emotions to avoid dealing with PTSD soldiers? Yes good points Len. It will always lead to the improved ability to control the masses. Until such time as someone figures out how to hack into it...it might take a couple of years until the tech in the wetware becomes obselete, but it will happen. Mordae! They let you back in, eh? I won't comment on that! Nano technology is already in our brain, the reason they would want to create more is mainly because they do not understand the natural technology. Can you imagine some company makes the chip that sets your emotions in gear going on strike? Hahahaha, I really don't find it funny and I am not laughing. We need to think about and study life on our planet, before we can enjoy such madness.